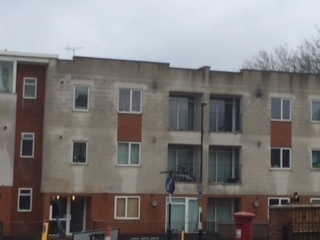 Whilst carrying out various Surveys and Valuations in Brockley, South East London our Surveyor noticed this modern block of flats which had very damp external walls where the blockwork was “shining” through the rendering. 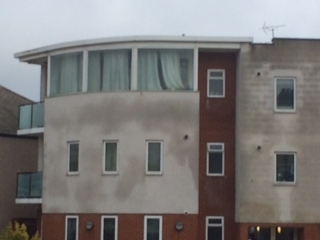 The render appeared porous and had not been finished with a masonry paint finish that is micro porous i.e. allows moisture trapped in the blockwork to escape and “breathe” outwards , but at the same time is fully weather proof and does not allow moisture in from the outside . It may take some time for this to dry out fully, then the appropriate external masonry paint should be applied . This is a very good example of poor design and workmanship. At Brian Gale Surveyors our experienced Chartered Building Surveyors understand elements of buildings that are poorly designed and the problems that these can lead to .